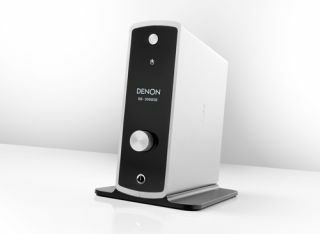 Denon launches DA-300USB high-definition USB DAC | What Hi-Fi? Denon has unveiled its first standalone USB digital-to-analogue converter (DAC), which it says will dramatically improve digital audio quality from your PC and other digital devices. It also has a built-in headphone amp. The DA-300USB incorporates the same Advanced AL32 Processing and the 32-bit, 192kHz conversion technologies as Denon's flagship CD/SACD players. Due to go on sale in February for £329, the new DAC has a USB-B input that lets you play digital music files and streaming audio with high sound quality. Your computer recognises the DA-300USB as an external soundcard, which will bypass its own lower-quality electronics. The DA-300USB can process any digital format from your computer's media player – like MP3/MP4 and FLAC HD (up to 24-bit/192kHz) and DSD. Additional coaxial and optical digital inputs will also let you enhance the sound quality of other digital devices, like CD and DVD players and games consoles.